Type 1 diabetes is an autoimmune disorder, meaning that the body’s immune system attacks its own pancreas affecting its ability to produce insulin; this usually happens at a young age. In this case scenario, insulin has to come into your body from outside a good example of which is an insulin pump. FYI not all autoimmune disorders happen at a young age. Type 2 diabetes is a different ball game. Contrary to the popular belief, increased sugar consumption doesn’t cause type 2 diabetes. Just because type 2 diabetes is linked to high levels of blood sugar, it may seem logical to assume that eating too much sugar is the cause of diabetes. However, it’s not that simple. High-sugar diet can increase the risk of developing diabetes but doesn’t directly cause it. There is no proven link between the two. By analogy, driving on the road can increase your risk for an accident but a mere fact of driving doesn’t cause it. What happens with type 2 is that people develop insulin resistance. Here’s how it works. When you consume sugar, it attaches to hemoglobin that delivers it to your body cells to be used for energy. Think about insulin as a key to open the door (of a cell) to let glucose in. In case of insulin resistance the door won’t open and glucose can’t get in. As a result, glucose builds up in the bloodstream instead of being absorbed by the cells. It is believed that excess weight and physical inactivity largely contribute to the insulin resistance. Genetics play a role, as well. 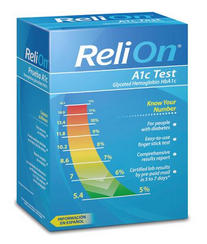 A1C is a widely used test to diagnose type 2 diabetes. It is also called HbA1C or glycated hemoglobin test. Hemoglobin is a substance found in the red blood cells which carry oxygen throughout your body. When blood sugar level is elevated, sugar combines with hemoglobin making it “glycated” in which case scenario A1C test shows an elevated number. This test is being used to show how well your diabetes is being controlled. Since red blood cells live up to 3 months, this test should be at this interval. This very test was used to diagnose my type 2 diabetes. For people without diabetes, the normal range for the A1C test is between 4% and 5.6%. A1C levels between 5.7% and 6.4% indicate increased risk of diabetes and levels of 6.5% or higher indicate diabetes. The goal for people with diabetes is a A1C level less than 7%. The higher the A1C number is, the higher the risks of developing diabetes-related complications. This entry was posted in A1C, About diabetes, blood sugar, diabetes, diet, Health, insulin resistance and tagged blood glucose, blood sugar spike, carbs, denial, diabetes, diet, dinner, fiber, lunch, menu, serving sizes, snack, spike, sugar-free, water. Bookmark the permalink. Reblogged this on Sandy Journalized. Thank you for sharing! I don’t have any experience with diabetes myself or with my family. This was very interesting to read. Interesting to get more information about this disease – for avoiding it personally as far as possible, and for understanding the needs of friends who are sufferers. I appreciate this clear explanation. My doctor recently told me that my A1C test is gradually increasing and is slightly over 6. She said to cut back on sugars and simple carbs which I’m working on. When I asked her, just out of curiosity, if only increasing my exercise would help, she said yes. That made me happy. Now I have work to do. Very concise and informative post. I can’t be an easy challenge to have to manage Diabetes on a daily basis. Thanks, Jackie. Having blessed with diabetes doesn’t mean that I can’t have sweets. I was told I can have a candy, yogurt, fruits, even ice cream but have to use portion control. A cup of milk and 2 squares of graham crackers are my bedtime snack (2 carbs). Wonderfully enlightening post, now my love for sugar now has me concerned for i consume ridiculous amounts in my coffee and or tea! Excellent – I always seem to hear about obesity and being overweight as causes of Type 2 diabetes, but this is much clearer! Thanks, Anna, for this. My grandmother (maternal), grandfather (paternal) and father all had type 2 diabetes. So I was not surprised when I was diagnosed a couple of years ago as “pre-diabetic”. I have worked very hard on diet, exercise and general lifestyle to keep it at bay. So far so good! Of course, all those things affect my pain levels and mental health as well so it is a win-win-win situation. Enjoyed your post! I just recently found out that skin tags could be aprecursor to diabetes. A warning sign same as numbness in the feet.